John Deere’s innovative 4010 tractor was easily one of the greatest successes any tractor company had since the industry was created. The 4010 included a plethora of innovative features that the rest of the industry either hadn’t even dreamed of yet or were only just experimenting with. It featured horsepower numbers that were head and shoulders above that of the competition. And, if those reasons weren’t enough to take the wind out of competitors’ sails, it was introduced so suddenly and unexpectedly that even Deere’s own salespeople needed to catch their breath at its release. In the midst of selling over 57,000 model 4010 tractors, Deere’s engineers looked to their suggestion box and found a few ways in which they could improve upon the tractor. When the series went through its transformation into the 20 series, these improvements were employed. When the 4020 diesel was tested in Nebraska in the fall of 1963, the first of these improvements was on display. Giving the engine an additional .125 inches of bore resulted in 24 more cubic inches of displacement and improved the horsepower of the tractor by about seven. Now capable of producing over 90 horsepower the 4020 diesel continued to stand ahead of its competition. This additional power did come at a cost, though, as the 4020 lost .77 horsepower hours per gallon in fuel economy to the 4010. The 4020 with a gasoline engine was capable of 88 horsepower. This again was seven more than its forerunner, and suffered the same dip in fuel economy. The LP version of the 4020 received an increase in compression to provide over 90 horsepower, an increase of 10. This engine was an improvement in both power and economy. The engines were a significant improvement, indeed, but the list of improvements in the 4020 didn’t stop there. Deere had been working for some time on a method that would allow the operator to shift between transmission speeds without having to stop, slow down, or even depress the clutch. Many of Deere’s competitors had released a transmission that could do this at least to some degree. Minneapolis-Moline had their Ampli-Torc and Magna Power systems, Ford had Select-O-Speed, and Case went with Case-O-Matic. 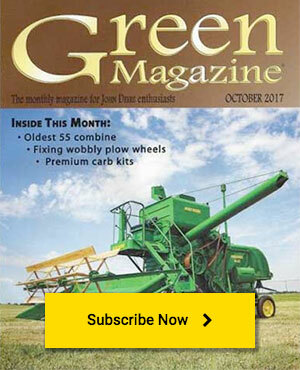 Deere experimented with a system that allowed speeds to be changed on the fly. This system, housed in a two cylinder tractor’s pulley, was utilized by pushing the clutch lever beyond the initial detent which engaged the clutch, to another which increased the torque sent to the wheels by decreasing the speed of the tractor. Deere never produced this system commercially, as they believed (and sold tractors under the premise) that “torque amplifiers” of that kind were nothing more than “torque substitutes”, and that a good tractor should be capable of getting work done without resorting to such workarounds. Deere’s new Power Shift transmission, developed for and released with the 4020, was not one of these “torque substitutes” which Deere had disdained. It was an entirely new style of transmission. A single lever was all that was required for an operator to switch between park, neutral, eight forward speeds, and four reverse speeds. Other company’s systems typically required two or more levers and a foot pedal. Eight forward speeds was a small number for tractors built in this period, but Deere felt that they had chosen these speeds very carefully to match all jobs that a farmer would do. And if that farmer felt that no speed quite fit the task at hand he could utilize the variable speed engine and run a bit more efficiently by pulling back on the throttle and slowing the engine a few RPM. The clutch was no longer necessary to shift the tractor at all. It was repurposed as the “inching pedal” and could be used to more easily move short distances. This was handy when attempting to hook up to implements. The 4020 still came with Deere’s dependable Syncro-Range transmission as standard equipment, and the Power Shift cost an additional $630.00. To compensate for the additional horsepower that the 4020’s revamped engine put through the powertrain, Deere strengthened both the Syncro transmission and the final drives. The canister fuel filters that were used on the 4010 were replaced for the 4020 with a screw-on type of fuel filter. This made servicing the filters much cleaner and quicker. At serial number 215000 in 1969, Deere changed the filter back to a canister type, but of a different sort than was used with the 4010. Deere’s introduction of the Power Shift transmission caused one small problem. When starting a tractor in cold weather it is typical to first step on the clutch to disconnect the engine from the transmission and allow the starter to spin the engine a bit faster. A 4020 equipped with a Power Shift had no real clutch, so there was no easy way to accomplish this same task. Deere’s engineers had considered this, however, and added an engine disconnect lever to the tractor. This uncoupled the engine from the transmission and made starting easier. In order to keep the longevity of the 4020 high, the PTO which was used on the 4010 had to be re-engineered to better stand up to the additional engine power. Replacing the flange type PTO stub shaft was a new and stronger double spline shaft. While this brought the increased strength that the parts may have needed, it made changing the PTO from 540 to 1000 RPM a significantly greater hassle. It now involved a lot more cleaning and a much greater amount of alacrity was required to keep the transmission from seeping all of its fluid out of the hole produced by removing one PTO shaft to install the other. Three body types were available when purchasing a 4020. Row crop, standard, and Hi-Crop tractors were the domestic versions of the tractor, and only slight changes were made when the tractors were exported. While there was no 4020 industrial, an industrial version of the tractor labeled the 600 was produced. In 1969, Deere decided that the standard and row crop tractors should be considered the same, and were just equipped with different options. 4020 tractors were extremely popular and sold in great numbers, but there are, as with nearly any John Deere tractor, some uncommon variations on the theme. A 4020 fueled by gasoline or LP-gas and not configured as a row crop is almost definitely rare. The 4020 was almost identical in appearance to the 4010. The instrument panel was changed to a more concave shape and the black now extended from the top of the instrument panel down and below the shift quadrant. The tachometer/hour meter was also updated a bit. Tractors equipped with Power Shift also included transmission temperature and pressure gauges. Instead of the “STOP” button that was on 4010 diesel tractors, pulling outward on the throttle knob and pushing the throttle beyond the idle position shut off 4020 diesels. The 4020 picked right up where its predecessor had left off and sold very, very well. Waterloo was running at full tilt, with more than 75 4020 tractors built each day. These tractors didn’t sell well simply because they were green, however. The 4020 had more and better standard features than any of its competition, often had superior support and service than other company’s tractors, and typically cost less. All of this, combined with the success its lineage, it’s really no surprise that the 4020 was the sales success that it was. After a year of producing the 4020, Deere spent a little more time on the engine, refining it a bit to make it easier to service. A new head was developed for the tractor. The primary difference between this head and the old one was that it now accepted 9.52m “pencil type” fuel injector nozzles rather than the older, larger, 25mm nozzles. The smaller nozzles allowed for a seal to be made more easily between the nozzle and the lines, and undoubtedly saved many farmers and tractor service men from headaches. 1965 model year tractors also gained a new feature that helped the operator to improve the tractor’s pulling power. A differential lock was incorporated into the 4020 and could be engaged by depressing a pedal located near the operator’s right heel. This operated a wet clutch via hydraulic pressure that locked the drive wheels together, forcing them to produce equal power. The 1965 model year tractors included one more change. The first 4020 standards had the same fenders that the 4010 tractors wore. 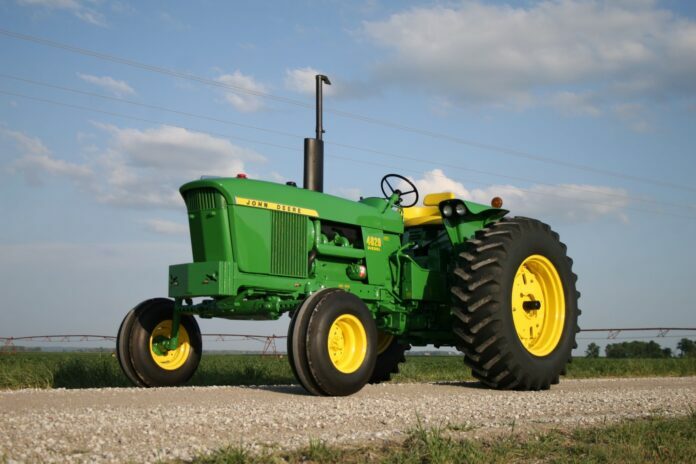 For 1965, 4020 standard tractors began using a different type of fender that included headlights in the front. These more closely matched the fenders used on row crop 4020s and the 5010. By 1969, Deere decided that the 4020 could use a bit of a revamping. It was not that the tractor was selling poorly; in fact, Deere was already beginning to call it a “classic”. Deere’s competition had finally begun to catch up to the 4020. Tractors built by the other companies were gaining features and power, and Deere simply wanted to be sure that they remained in the lead. The primary change that came to the 4020 in 1969 has come to label the entire generation. The two cylinder John Deere tractors were sometimes criticized for requiring too much of the operator’s hands. Having a hand- rather than foot-operated clutch meant that the operator could not steer, clutch, and operate machinery at the same time. Typically this was not a problem, but it did make some work extremely difficult to accomplish. The New Generation tractors had remedied this problem with the foot clutch, but times were changing, and the use of multiple pieces of equipment simultaneously was becoming more popular. Suddenly two levers were required for many more tasks than before. To remedy this situation, Deere decided to move many of the tractor’s controls to a single location and to make that location as convenient as possible for the operator. A suitable location was found to be just in front of and to the right of the operator’s seat. This was a natural place for the operator’s right hand to rest, and made it easy to control any of the hydraulic controls or the three-point. This writer can remember, when in his younger years, reaching through the steering wheel of a 4010 with his right hand to control the hydraulics when not wanting to let go of the steering wheel with his left. The console 4020 tractors made such awkward maneuvers a thing of the past. The PTO lever, which now controlled the PTO via hydraulics on both Syncro-Range and Power Shift models, was relocated to the left side of the dash. Deere went on to improve the engine block, pistons, rings, and liners on the 4020. The air cleaner had been changed from an oil bath type to a dry type in 1966, and it was updated again in 1969 with a dust unloading valve. The muffler on the tractor was replaced with an oval version. This improved the operator’s line of sight by a few inches and made the tractor look a bit more streamlined. The intake valve was updated and helped bring more air to the engine. Finally, and probably most importantly, the electrical system in the console 4020 was changed from 24 volt positive ground to 12 volt negative ground. This required that the generator be replaced with an alternator. This change made the tractor’s electrical system more reliable and made finding electrical accessories for your tractor an easier task. From their release, 4020 tractors could be ordered with a cab, the first of which were made by Crenlo. One version for standard tractors without a three-point hitch had the doors in the back, the other, for row crop tractors, had doors in the front. These all steel cabs had windshield wipers and could be ordered with heat but not air conditioning. Stolper cabs eventually replaced those made by Crenlo. These Stolper cabs slanted inward from the midpoint down and included an extended first step for mounting and dismounting. Deere began purchasing cabs from the Hinson Company while still buying Stolper cabs. Hinson cabs included Deere’s roll over protection system (ROPS) and cost $700 more than Stolper cabs, and either could be purchased for some time. Eventually, though, Deere decided it better to not give customers the choice of whether or not they wanted to be protected in the case of a roll over, and the Stolper cabs were dropped. Air conditioning became an option on 4020s equipped with cabs sometime between 1968 and 1970. The earliest 4020 tractor that we are aware of with factory-installed air conditioning is serial number 229460, which was built in 1970. At least one Waterloo factory document, however, noted that the option was initially available starting with the 1969 model year, which began in fall of 1968. If any readers have a 4020 with original air conditioning that is earlier than the aforementioned serial number we would like to hear about it. The 1969 model year also brought another new option. Hydrostatic front wheel drive for the 4020 allowed an operator to increase his tractor’s traction by up to 20 percent. This convenient feature could be switched on and off on the go, and offered two settings. In high torque mode the tractor gained a substantial increase in pull for heavy work. Light torque mode was intended to increase steering control while pulling, particularly on sloped ground. Time proved that the feature left a bit to be desired in durability, and the $1,900 price tag makes it unlikely that you will see many of these at the next tractor show that you go to. Another manufacturer had actually beaten Deere to the punch. Elwood Manufacturing of Elwood, Illinois was in the business of building OEM front axles for International Harvester, but they also sold front axles for a number of different tractors including the 4020. Offering “up to 50 percent more pull power from the tractor,” the Elwood axle cost $2,075 in 1966. The company also said that the axle could be removed and switched out for the original one in about an hour. Deere exported 4020 tractors to Europe. The tractor was nearly identical to the North American row crop version of the tractor, but they sported additional lights and clamshell fenders. German-built cabs were available for these tractors. Deere also built a special version of the 4020 for Latin American customers. These stripped down versions of the 4020 were labeled the 4025 and given a “C” prefix on the serial number registry. They also were equipped with an auxiliary fuel filter on the right side. There were only a few years left for the 4020. In the fall of 1972, Deere’s Generation II tractors were introduced. These tractors rolled all of the successful technology that had gone into making the 4020 such a remarkable tractor into a series that boasted more comfort, and convenience. Some owners were in no hurry to upgrade, however, pushing some to ask the question, “did Deere build the 4020 too well?” These tractors continued to perform day after day, they actually had more horsepower than their similarly sized Generation II brothers, and some farmers simply felt at home atop their 4020. The tractor just fit some farms so well that a farmer couldn’t imagine working without it. Parts for 4020 tractors are still quite easy to come by. Deere still sells many parts for the tractors, as do after market suppliers. Some 4020s have been scrapped and the used part supply is vast. In some cases the original parts are of higher quality, in others the new version of the part is the way to go, and of course there are some that are identical. Many older 4020s (and their owners) would benefit from getting the tractor converted to the 12 volt system. This is not a difficult project to undertake and will make your tractor much more reliable. Just remember to keep the old 24 volt parts if you are worried about getting a ticket from the “Correct Police”. The 4020 continues to be the epitome of John Deere tractors. Deere took a great tractor and made it better when they improved upon the 4010. I would be willing to bet that if you polled a group of 4020 owners who use a number of tractors and asked them which they would give up if they had to, none of them would choose the 4020. It is really no wonder that there are books and websites devoted to the tractor, and even a band named after it. Front power take-off delivers full engine power for 1000 RPM operation. Sensing mechanism transmits implement signals to the hydraulic system. Exclusive rack-and-pinion adjustment saves effort in spacing wheels. Independent power take-off handles 1000-540 RPM equipment. Big capacity power brakes (regular) permit short turns at row ends. Selector lever provides Load, Depth and Load-and-Depth control for hitch. Position-responsive rockshaft operates in direct relation to control lever. Power differential lock can be engaged hydraulically on-the-go for better traction. Double-action remote cylinders control drawn equipment accurately. Universal three-point hitch handles both Category 1 and 2 equipment. Posture seat adjusts to weight and height for greater riding comfort. Hand and foot throttles provide a wide range of governed engine speeds. Smooth power steering (regular) saves effort and fatigue on every job. Hydraulic system offers up to three “live” circuits for implement control. Selective control valve permits operating one or two remote cylinders. Gas and diesel engines across the board; LP-Gas, too, for 3020 and 4020 models. Front-mounted fuel tank keeps hood line low for a better view of the work. Oil cooler dissipates heat from transmission and hydraulic system. Variable-speed engine provides husky, flexible power for every requirement. Heavy clutch and flywheel help carry tractor through tough spots. Dual rack-and-pinion steering motor turns front wheels at your command. Exclusive variable-displacement pump provides hydraulic power on demand. Exclusive Roll-O-Matic front wheels cut front end bounce in half. Power Shift provides straight-through shifting without clutching. Previous articleAsk Mr. Thinker – 4010LP with 1000 RPM PTO Shaft?